Dr. Michael Mendez serves as the inaugural James and Mary Pinchot Faculty Fellow in Sustainability Studies at the Yale School of Forestry and Environmental Studies. Michael has more than a decade of senior-level experience in the public and private sectors, where he consulted and actively engaged in the policymaking process. This included working for the California State Legislature as a senior consultant, lobbyist, gubernatorial appointee, and as vice chair of the Sacramento City Planning Commission. During his time at Yale, he has contributed to state and national research policy initiatives, including serving as an advisor to a California Air Resources Board member, and as a participant of the U.S. Global Change Research Program’s workgroup on “Climate Vulnerability and Social Science Perspectives.” Most recently, Michael was appointed by the National Academies of Sciences, Engineering, and Medicine to the Board on Environmental Change and Society (BECS). He also serves as a panel reviewer for the National Academies of Sciences’ Transit Cooperative Research Program (TCRP). Michael holds three degrees in environmental planning and policy, including a PhD from UC Berkeley's Department of City and Regional Planning, and a graduate degree from MIT. His research on the intersection of climate change and communities of color has been featured in national publications including Urban Land (published by the Urban Land Institute); the Natural Resources Defense Fund Annual Report; the American Planning Association’s Planning Magazine; Green 2.0: Leadership at Work; USA Today; and Fox Latino News. Dr. Mendez’s forthcoming book “Climate Change from the Streets,” will be published by Yale University Press (Accepted, Fall 2019). In the book, he uses a combination of theoretical and policy-relevant research to analyze the narratives of climate change as articulated by social movements, experts, and subnational governments. Particular focus is placed on the story of how environmental justice groups in California are enacting multiscalar climate solutions, not only to tackle a global phenomenon, but also to address the needs of local communities already facing air pollution’s adverse impacts. Their example illustrates the potential for new directions in climate change policy worldwide. From the streets of Oakland to the legislative halls of the state capitol, and beyond the tropical forests of Mexico and Brazil, in the book, Michael traces environmental justice groups as they travel between geographies and policy scales to contest or legitimize climate policies. The movement of environmental justice actors across space and time demonstrates how these community-based groups are influencing climate change policy formation and implementation within and between nation-states. Through this multiscalar analysis, he argues that the integration of alternative types of knowledges and practice can inform better climate policy solutions. Through a combination of social theory, fieldwork, and engagement with civic leaders, the objective of my teaching is to provide students with a critical understanding of urban problems and the methods needed to address environmental health inequities in neighborhoods. At Yale, I teach courses on environmental policy, sustainability, health, and equity, with a particular focus on community-engaged learning with state and local policymakers. At the University of Washington, University of San Francisco, and UC Berkeley, I served as the instructor for the Doris Duke Conservation Scholars Program, Urban Sustainability & Environmental Governance Practicum, and the Climate Action Planning Studio. I was appointed the lead graduate student instructor for the following graduate-level courses: Youth Urban Planning Studio; Healthy Cities; Environmental Policy and Regulation Studio; and Introduction to Planning Practice. I have also served two years as a research mentor for the Summer Research Opportunity Program (SROP) administered by the graduate division at UC Berkeley. SROP is an intensive academic program for undergraduate students from traditionally disadvantaged communities interested in exploring careers in academia. In the program, I developed pedagogical approaches that required students to engage in community-based research projects with local environmental justice groups. 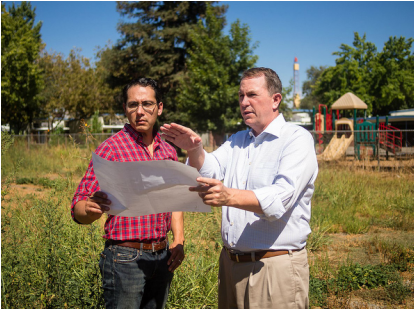 Consulting with Sacramento School Board President Jay Hansen on vacant land reserved for a 3-acre instructional urban farm and community garden project. The project is scheduled to break ground in 2016. Conversing with GESA International Environmental Fellows at the University of Bern, Switzerland.